"Play it by Ear, Sam." 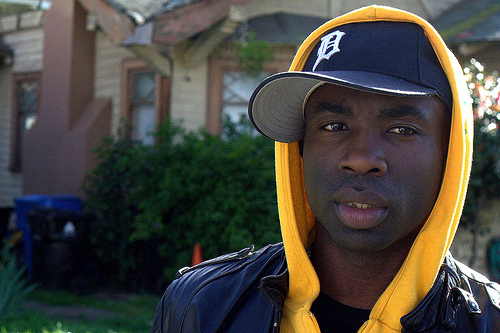 An interview with Sam Sarpong. I’m sitting with Sam Sarpong in a small conference room with Tatyana Ali minutes before Sam’s photo shoot for Switch Magazine and he’s just made a joke about how people recognize him, but they don’t know from where. I don’t know who Sam Sarpong is. In fact, I’m winging this entire interview because I don’t have a press kit nor did I even know this interview was going to happen. “But you make the most of it, right, René?” Sam asks, encouragingly. In twenty minutes, I’ve gotten to know Sam Sarpong better than I know a lot of people in my life. In fact, he has me wondering why I haven’t heard of him before. Film, television, modeling, music; Sam is a one-man media deluge. For six years he was the face of Tommy Hilfiger and was the third black male model to have an exclusive contract the likes of Tyrese and Tyson. He had a recurring role on the hit television show, Boston Public (FOX) and he continues to play his recurring role on ER (NBC), as Antwan Celes. Sam has also signed on as a season regular on Veronica Mars (UPN). Sam recently starred in Love Don’t Cost a Thing and can be seen in the upcoming movie, Lucky 13. Musically, Sam has worked with stars like Beyoncé Knowles and Will Smith and currently has a new rap album in the works with his group, The League. Even with such an impressive serving on his plate, Sam still has room for more. As I ask Sam about his latest project, a reality show for MTV, which showcases Sam’s journey through the industry, he makes sure to get some footage of me on his handheld camera. One interesting segment on Life of an Entertainer is when Sam loses the role of Future—which coincidentally is Sam’s rap name in real life—in 8 Mile to Mekhi Phifer. I had the opportunity to watch a clip from the show and, without giving anything away, the kinds of connections Sam has will blow your mind. Unfortunately we’re going to have to wait until May or June to have our minds blown because the industry big wigs want to air the show at the same time as Sam’s new movie. The industry is not always about success and Sam made sure I knew that. He recounted numerous parts he’s been turned down for, but he stays resolutely positive and doesn’t sweat the small things. Like other serious music artists, Sam is deeply into his music. Amidst the hustle and bustle of the photo shoot, Sam took time to rap along to his song “Heaven Only Knows,” a pro-God rap with tight beats and lyrics that flow. In the second verse, Sam gives props to his father. Sam is currently working on a new rap album with his group, The League, which also features Mike Kasem, son of legendary DJ Casey Kasem. The album is due out around May or June. We talked a little longer before his photo shoot about the other things going on in Sam’s life, like his spread in GQ and his Levi’s campaign and his three Miller Lite spots currently airing, but what engaged me most was Sam, himself. He really talks to you. Granted, Sam is his own best publicist, selling himself to you and pitching the title of his show every chance he gets, but he also wants you to know about him as a person. I know you now, Sam. This year, the rest of the world will, too.